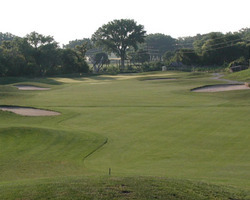 Golf Zoo just added CrossCreek Golf Club in Temecula Creek, CA to our San Diego offerings. Not only is this one of the most impressive golf courses in all of Southern California, but it's only an hour from downtown San Diego and the same from Los Angeles. The course is easily accessible off the I-15 yet tucked back in the foothills surrounded by beautiful countryside with no homes and 360 degree views of the surrounding mountains.The historic Temecula Valley itself offers so much, an array of great wineries, hot-air ballooning and the Pechanga Casino is one of the very best. The creation of renowned golf course architect Arthur Hills, CrossCreek is another masterpiece from the man who was entrusted to renovate such national treasures and US Open venues as Oakmont, Inverness and Oakland Hills. Come to Temecula, stay at the wonderful Temecula Creek Inn, play 27 holes of golf at the Inn, play CrossCreek, visit the wineries and the casino and you'll be sure to return. Life in the Trap Golf Comics Are Back!